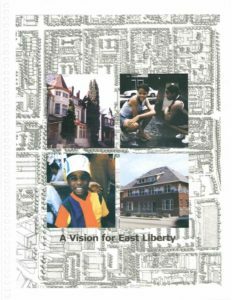 East Liberty’s first community plan, A Vision for East Liberty, helped guide the neighborhood’s recovery from the scars left by well-intentioned but ultimately destructive urban renewal efforts. The plan’s clear establishment of priorities allowed to leverage significant financial resources and institutional support. Dramatic physical, social, and economic changes have occurred in East liberty as a result. 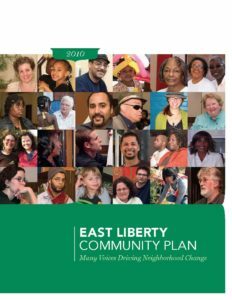 The 2010 East Liberty Community Plan is a long-term framework for revitalization. Its purpose, building upon the 1999 East Liberty Community Plan, A Vision for East Liberty, is to guide the ever-evolving process of planning and development. Capturing many voices to drive neighborhood change, this plan sets our community’s goals and ensures that we do not stray from our core principles.